Shad and river herring are anadromous fish that spend the majority of their adult lives at sea, only returning to freshwater in the spring to spawn. Historically, shad and river herring spawned in virtually every river and tributary along the coast. Shad young leave their home river within the first year and will spend the next few years at sea, schooling in large numbers with shad from other regions and feeding on plankton and other small fish or crustaceans. Upon reaching maturity – at about age four – they will return to the streams they were born in to spawn. Males or "buck shad" return first, followed by females or "roe shad." They spawn usually at night or during overcast days. In the southern range, females release as many as 700,000 eggs during the spawning season, but both males and females normally die after spawning. In the northern range, females typically release 300,000 eggs or less during the spawning season; however, most shad will return again to spawn in the following years, with some shad living up to ten years. River herring is a collective term for alewife and blueback herring. Alewife spawn in rivers, lakes, and tributaries from northeastern Newfoundland to South Carolina, but are most abundant in the Mid-Atlantic and the Northeast. Blueback herring prefer to spawn in swift flowing rivers and tributaries from Nova Scotia to northern Florida, but are most numerous in waters from Chesapeake Bay south. Mature alewife (ages three to eight) and blueback herring (ages three to six) migrate rapidly downstream after spawning. Juveniles remain in tidal freshwater nursery areas in spring and early summer, but may also move upstream with the encroachment of saline water. As water temperatures decline in the fall, juveniles move downstream to more saline waters. Little information is available on the life history of juvenile and adult river herring after they emigrate to the sea and before they mature and return to freshwater to spawn. Shad and river herring once supported the largest and most important commercial and recreational fisheries along the Atlantic coast. Since colonial times, the blockage of spawning rivers by dams and other impediments, combined with habitat degradation and overfishing, have severely depleted shad and river herring populations. Commercial landings for these species have declined dramatically from historic highs. Commercial landings by domestic and foreign fleets peaked at 140 million pounds in 1969. Since 2000, domestic landings totaled less than four million pounds in any given year, with a historic low of 823,000 pounds occurring in 2006. In 2005, the directed at-sea fishery for American shad was closed, and subsequent landings from the ocean are only from the bycatch fishery. In 2017, approximately 381,242 pounds of American shad were landed, while an estimated 1.7 million pounds of river herring were landed. Recreational catches of these species remain largely unknown. Anecdotally, recreational fishing for American shad is popular coastwide during the spring spawning run, but harvest information is unreliable. The Marine Recreational Information Program (MRIP) estimates numbers harvested and released by anglers, but estimates are imprecise, show few trends, and are deemed not useful for management purposes. Furthermore, MRIP concentrates its sampling strata in coastal waters and does not capture data on recreational fisheries occurring in inland waters. 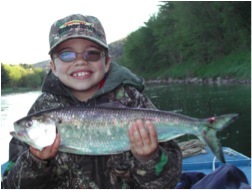 Few states conduct creel surveys or other consistent survey instruments (diary or log books) in inland waters to collect data on recreational shad and river herring catch. Some data are reported in the state chapters of the current stock assessment, but data are too sparse to conduct systematic comparisons of trends. The Commission also continues to collaborate with NEFMC and MAFMC to address bycatch of these species in federal fisheries. The Councils set the annual catch cap for shad and river herring at 796,005 pounds for 2019. 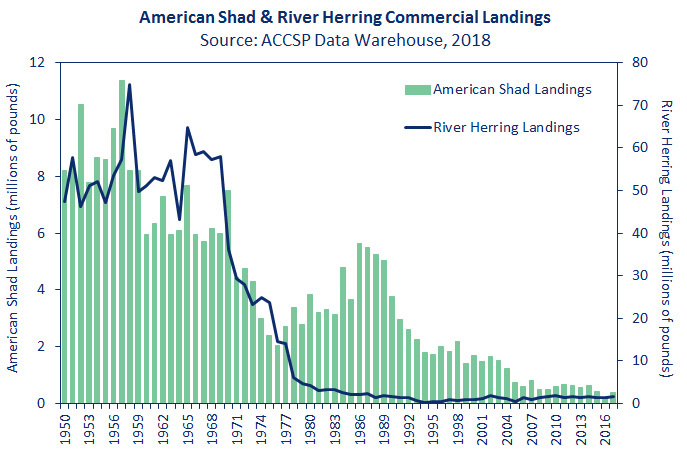 The last coastwide stock assessment for American shad was completed in 2007, which found that stocks are currently at all-time lows and do not appear to be recovering. Recent declines in stock abundance were reported for Maine, New Hampshire, Rhode Island and Georgia, and for the Hudson (NY), Susquehanna (PA), James (VA) and Edisto (SC) Rivers. Low and stable stock abundance was indicated for Massachusetts, Connecticut, Delaware, Chesapeake Bay, the Rappahannock River (VA) and some South Carolina and Florida stocks. The Potomac River stock has shown rebuilding in recent years. Primary causes for stock decline were identified, including overfishing, pollution and habitat loss due to dam construction. A peer review panel recommended that current restoration actions should be reviewed and new ones should be identified and applied, and suggested considering a reduction of fishing mortality, enhancement of dam passage and mitigation of dam-related fish mortality, stocking and habitat restoration. There are no coastwide reference points for American shad. A benchmark stock assessment was initiated in 2017 to analyze American shad stock status, with expected completion in 2020. The Commission has not conducted a coastwide assessment of hickory shad stock status. The 2012 river herring benchmark stock assessment found that of the 52 stocks of alewife and blueback herring assessed, 23 were depleted relative to historic levels, one was increasing, and the status of 28 stocks could not be determined because the time-series of available data was too short. Estimates of abundance and fishing mortality could not be developed due to lack of data. The “depleted” determination was used instead of “overfished” and “overfishing” to indicate factors besides fishing have contributed to the decline, including habitat loss, predation and climate change. The 2017 stock assessment update indicates that river herring remain depleted at near historic lows on a coastwide basis. Total mortality estimates over the final three years of the data time series (2013-2015) are generally high and exceed region-specific reference points for some rivers. However, there are some positive signs of improvement for some river systems. Total mortality estimates for 2 rivers have fallen below region-specific reference points during the final three years of the data time series, compared to the zero estimates that were below reference points at the end of the 2012 stock assessment data time series. Of the 54 stocks for which data were available, 16 experienced increasing abundance, 2 experienced decreasing abundance, 8 experienced stable abundance and 10 experienced no discernable trend in abundance over the final 10 years of the time series (2006-2015). In 2011, the National Resources Defense Council petitioned NOAA Fisheries to list river herring on the endangered species list throughout all or part of the species range. NOAA Fisheries conducted a status review and found that the listing was not warranted in 2013, and agreed to reevaluate the listing determination within five years. In addition, NOAA Fisheries committed to partnering with the Commission and other stakeholders to develop a comprehensive conservation plan for river herring throughout its entire range. In 2015, the River Herring Technical Expert Working Group (TEWG), a group of scientists, industry representatives, conservation groups, tribal leaders and government officials with expertise in river herring conservation, convened to provide input and information on the River Herring Conservation Plan. The Plan, which was released by the Commission and NOAA Fisheries in May 2015, seeks to increase public awareness about river herring and foster cooperative research and conservation efforts to restore river herring along the Atlantic coast. The Plan, which can be found online at http://www.greateratlantic.fisheries.noaa.gov/protected/riverherring/conserv/index.html, builds upon past and current river herring conservation projects and coordinates ongoing activities, and will be further developed over time with public input. Shad are managed under Amendment 3 to the Interstate Fishery Management Plan (FMP) for Shad and River Herring. Amendment 3 (2010) revised the American shad regulatory and monitoring programs in response to the 2007 American shad stock assessment, which found that most American shad stocks were at all-time lows and did not appear to be recovering. The Amendment requires states and jurisdictions to develop sustainable fishery management plans (SFMPs), which are reviewed by the Technical Committee and approved by the Board, in order to maintain commercial and recreational fisheries past January 2013. The following states have produced SFMPs for shad. Amendment 3 also requires states and jurisdictions to submit a habitat plan regardless of whether their commercial fishery would remain open. The habitat plans outline current and historical spawning and nursery habitat, threats to those habitats, and habitat restoration programs in each of the river systems. They provide a river system-specific, comprehensive picture of major threats to American shad in each state to aid in future management efforts, and include collaboration with other state and federal agencies (e.g., state inland fish and wildlife agencies, water quality agencies, U.S Army Corps of Engineers). The two largest threats identified in the habitat plans were barriers to migration and a lack of information on the consequences of climate change. A key benefit of the habitat plans is that each river system relevant to shad now has its threats characterized. The habitat plans are filed with the Federal Energy Regulatory Commission to ensure that shad habitat is considered when hydropower dams are licensed. They are also shared with inland fisheries divisions to aid in habitat monitoring and restoration efforts. A majority of the habitat plans were approved by the Board in February 2014, and it is anticipated that they will be updated every five years. River herring are managed under Amendment 2 (2009) to the FMP for Shad and River Herring, which addresses concerns regarding declining river herring populations. Similarly to shad, the Amendment requires that states and jurisdictions develop SFMPs in order to maintain a commercial and/or recreational river herring fishery past January 2012. 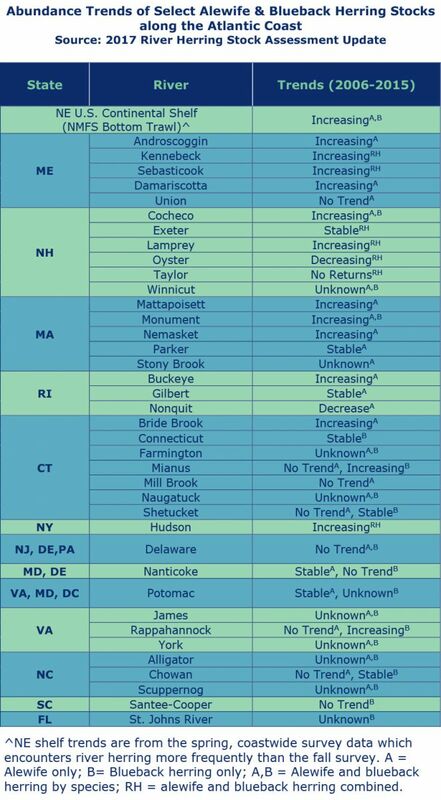 For 2019, approved River Herring SFMPs remained in effect for the states listed below. The remaining states and jurisdictions have closed their commercial and recreational fisheries.